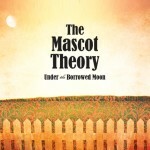 The Mascot Theory’s Facebook page provides an appropriate description of the band and its music: “a full-fat, high-energy dose of Americana-tinged, folk-country rock” with lyrics and melodies laced with “passion, depth, reflection and accusation working across a spread of influences.” That sums it up nicely. These guys are messengers with stories to tell. On the band’s debut album, Under the Borrowed Moon, there’s pain, sadness, anger, regret, disappointment, and a hope for something more — in every song. That’s a lot of emotion to try and pack in every song, but they do it. There are songs of war times, songs of the apocalypse, songs of suicide, songs of a life wasted. It hits you once you’ve listened to the last track, “Meet-Your-Maker-Tavern” — man, that was a whole lot of story in a short amount of time. You’re stronger and wiser for having stayed for the entire tale. Lead vocalist Erik Kjelland wants to be a better man than he thinks he is. He’s trying to do something good or save somebody, maybe himself, with his lyrics and passionate voice. You’ll realize right away that there’s some strong musicianship on display here. Nick Fry holds everything, and everyone, together on the upright bass, Adam White provides some grit and anger with the electric guitar, and drummer Paul Metz delivers a special energy, attitude and fellowship familiar to fans of folk. There’s a brotherhood going on here with these guys. They each know their role and take full responsibility for making sure the tale gets told. The album has moments that might remind you of Mumford and Sons, with harmonies and banjos and mandolins, and then you hear Ryan Adams in the amped-up sadness of the country-rock tunes. There’s even a nod to Springsteen now and then. Jason is a copywriter/freelance writer and rockstar wannabe living in Middleton. He loves music of all genres and is a staunch supporter of local bands. Rock on Madison!